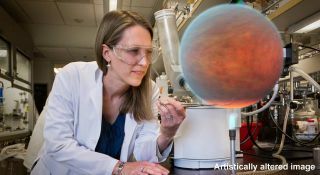 If astronomers could pull planets out of the sky and analyze them in the lab, it might look something like this artistically altered image illustrating new research from NASA's infrared Spitzer Space Telescope. Spitzer allows astronomers to study the atmospheres of "hot Jupiter" exoplanets, which orbit very close to their parent stars. Scientists are starting to get a bead on "hot Jupiter" alien planets, huge and exotic worlds that have no counterpart in our own solar system. Observations by NASA's Spitzer Space Telescope are giving researchers some good looks at these scorching-hot gas giants, revealing howling winds and a variety of climates. But as often happens in science, the new finds are generating as many questions as they answer. "We are just starting to put together the puzzle pieces of what's happening with these planets, and we still don't know what the final picture will be," Lewis added. Hot Jupiters orbit extremely close to their parent stars, usually completing an orbit in just a few days. As a result, they're blisteringly hot and often tidally locked, showing only one face to their star (just as the moon is tidally locked to Earth). Because of their enormous size and orbital proximity, hot Jupiters are relatively easy to detect. The first exoplanet ever detected around a sun-like star, in fact, was the hot Jupiter 51 Pegasi b, which Swiss astronomers found in 1995 by picking up on the wobble the planet's gravity induced in its parent star. While researchers soon found dozens more hot Jupiters, it turns out that the planets are not terribly common in the cosmic scheme of things. Observations by NASA's planet-hunting Kepler space telescope, for example, suggest that small, rocky planets like Earth are much more abundant throughout the Milky Way galaxy. Spitzer probed the atmosphere of a hot Jupiter for the first time in 2005, in the process becoming the first telescope ever to detect light emitted by an alien world. Since then, the instrument has gotten looks at dozens of hot Jupiters, yielding insights about their composition and climate. "When Spitzer launched in 2003, we had no idea it would prove to be a giant in the field of exoplanet science," Michael Werner, Spitzer project scientist at NASA's Jet Propulsion Laboratory in Pasadena, Calif., said in a statement. "Now, we're moving farther into the field of comparative planetary science, where we can look at these objects as a class, and not just as individuals." In the new study, which was published in March in The Astrophysical Journal, Lewis and her team stared at HAT-P-2b for six days — the longest Spitzer observation of a hot Jupiter yet. During this time, they saw the planet cross the face of its host star, disappear behind it and then emerge again on the other side. HAT-P-2b has a very eccentric orbit, coming as close to its star as 2.8 million miles (4.5 million kilometers) and as far out as 9.3 million miles (15 million km). "It's as if nature has given us a perfect lab experiment with this system," co-author Heather Knutson, of Caltech in Pasadena, said in a statement. "Because the planet's distance to the sun changes, we can watch how fast it takes to heat up and cool down. It's as though we're turning the heat knob up on our planet and watching what happens." The team found that it takes HAT-P-2b about a day to heat up as it nears its star, and four or five days to cool down as it moves away again. Spitzer also observed strange and unexpected behavior in the planet's carbon chemistry, which further adds to the mysteries posed by hot Jupiters. "Theories are being shot down right and left," co-author Nick Cowan, of Northwestern University in Illinois, said in a statement. "Right now, it's like the wild, wild west."